First lady Michelle Obama and Oprah Winfrey speak at the White House summit on the United State of Women in Washington, D.C., on June 14, 2016. 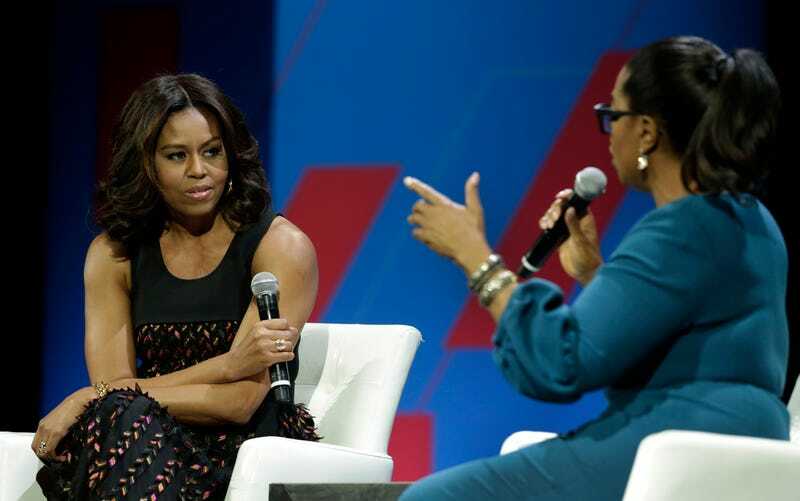 That was the advice first lady Michelle Obama had for women as she spoke with Oprah Winfrey during the White House’s first United State of Women summit this week. Obama responded, “I tell my mentees, I tell my daughters […] that our first job in life as women, I think, is to get to know ourselves. And I think a lot of times we don’t do that. We spend our time pleasing, satisfying, looking out into the world to define who we are—listening to the messages, the images, the limited definitions that people have of who we are. And that’s true for women of color for sure. "There is a limited box that we are put in, and if we live by that limited definition, we miss out on a lot of who we are. But it takes taking the time to know who you are to be able to deal with the onslaught of negative messages that you’re bound to get. So for me, I came into this with a pretty clear sense of myself. And some of that comes with age. Some of that comes with experience,” the first lady concluded. The United State of Women summit was a comprehensive gathering on women’s issues in Washington featuring top leaders in business, technology and women’s advocacy. The summit focused on pay equity, higher education, health issues, self-esteem and career advancement. Winfrey, Vice President Joe Biden and, of course, the first lady’s husband, President Barack Obama, addressed the daylong event, which was packed with data and information on the current state of women in American society. “Our country isn’t just all about the Benjamins—it’s about the Tubmans, too,” the president said amusingly during his address. “The year I was born, in 1961, women made up less than 40 percent of college students. Today, you earn almost 60 percent of college degrees, make up roughly half of the workforce. … In the old days, women actually needed a husband to open a credit card. Today, more women are choosing to be single,” President Obama added. Despite making up 47 percent of the U.S. workforce, women, on average, still only earn 77 cents for every dollar earned by a man. African-American women are paid 64 cents for each dollar white men are paid, and Hispanic women only make 54 cents for every dollar paid to white men. Last week the National Center For Education Statistics revealed that black women are No. 1 among all other groups in America in terms of overall college enrollment. "As the great Shirley Chisholm once said, ‘The emotional, sexual and psychological stereotyping of females begin[s] when the doctor says, “It’s a girl.”’ That has consequences for all of us, whether we’re men or women," President Obama said pointedly during the summit. "We need to keep changing the attitude that raises our girls to be demure, and our boys to be assertive; that criticizes our daughters for speaking out, and our sons for shedding a tear," the president said, echoing some of the themes spoken throughout the day. Participants at the summit included Melanie Campbell, president of the National Coalition on Black Civic Participation; Anne Marie Chavez, CEO of Girl Scouts USA; Rep. Donna Edwards (D-Md. ); Beth Williams, CEO of Roxbury Technology; and Debra Lee, CEO of Black Entertainment Television. On June 23 the White House will host a summit around issues facing working families. In late June the first lady will travel with her daughters, Malia and Sasha Obama, and her mother, Marian Robinson, to Liberia, Morocco and Spain for Let Girls Learn to highlight the U.S. government’s work to help adolescent girls go to school and stay in school.